Miah Bryant, a senior studying fashion textile design, and Naomi Ejim, a senior studying Africana studies, dance with their friends at the Trap ‘n Paint event in Talley Student Union on Monday, April 8. 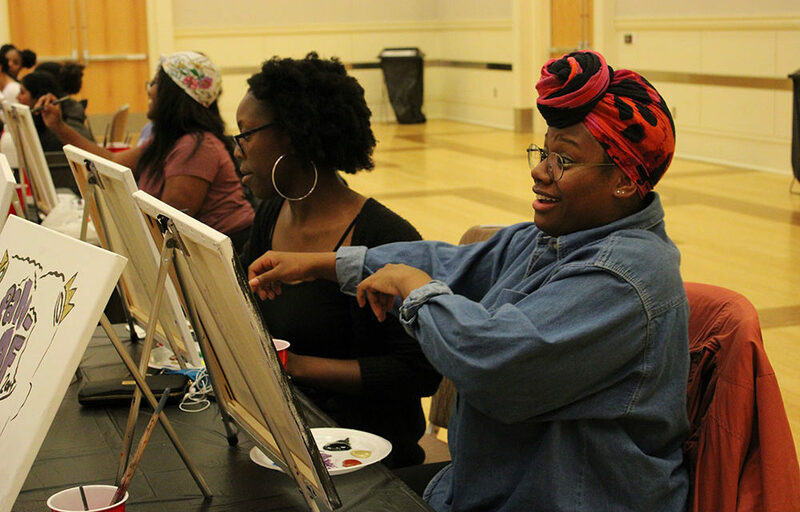 On Monday, April 8, University Activities Board’s Black Students Board hosted Trap N Paint as part of Pan-Afrikan Week in Mountain-Piedmont Ballroom in Talley Student Union. This annual event combined painting with listening to trap music. Students were given pre-drawn canvases to start them out, though most painted over and made it their own. Paintings ranged from different designs of Pan-Af posters to people creating their own designs of blackness. A common theme was the illustration of black kings and queens. Overall, many students had similar thoughts on the event. They liked the idea of black students coming together in a space where they can be themselves. Michaela Steele is a first-year studying technology, engineering and design education. Some students loved listening to trap music while painting because it was relaxing and livened the mood. Students were encouraged to sing along and dance to their favorite trap song. There was even a ‘recess’ that invited students to stop painting and dance and have fun with friends. Other students stressed the importance of having these events on campus. “I think it’s extremely important to have these events on campus,” said Josie Thompson, a second-year studying elementary education and vice chair of concerts and entertainment at UAB. “I feel like celebrating certain cultures, such as this, having that space where people can feel free to do so with other people who also appreciate that, I think it’s a positive environment.